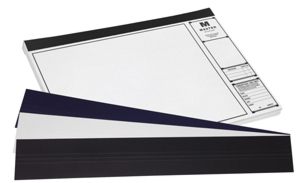 Securely bind your plans for convenient carrying, storage or reference with these quality blueprint binding strips. Each strip is made of 125lb tag stock, triple scored and can hold up to (150) 20lb sheets. Blank strips sold in packs of 500 or 1000. Custom Print strips sold in packs of 1000. Available in Black, White or Blue. Custom colors available by Special Order.